I bought this toaster to replace my old 2 slice one and am very pleased with the way this toaster works. Even browning and also has various settings depending on what you're toasting. I use this product a few times a day! For breakfast we have a family of 5 so this makes it easier to toast bread instead of 2 at a time. Great for toast and even when I make bagels it awesome way better than a lot of the toasters that I have purchased in the past that only last 1 year or so! I have had this toaster for 2 years now and still looks new and works great still! There are many different settings like bagels, defrost which is great! For me it's easy to clean, has a door on the bottom to open and get the excess crumbs out for avoid any crumb piles up! 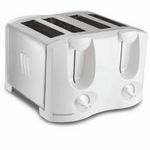 I haven't had any issues at all with this product just wish I would of found it in the color black to match my kitchen but other than that this is my best toaster yet especially if you have a big family! My husband and I received this toaster as a wedding gift, over 7 years ago. We have since used this toaster nearly on a daily basis. I love that it is very modern looking in the brushed chrome color. It matches our kitchen perfectly as we have all new stainless steel appliances. The 4 slots are wide - you can easily fit a large bagel in each slot. There are two sets of controls so that you can adjust the darkness to two separate levels on each of the sides, which I like. Also, it does automatically pop up after a certain amount of time, but I do find that on some items I have to push it down a second time and then manually pop it up about mid-way through the second cycle. Regardless, it's a great little toaster. After 7 years of use the right side (two slots) no longer will stay down and/or heat, but I love this toaster so much I am planning to buy another one just like it. I would say 7+ years out of a toaster is pretty good. I have been very happy with this toaster and would definitely recommend it to a friend. 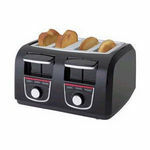 This is a great toaster.My main complaint is that I think the toaster is overpriced. It does its job, and a great job at that but its not a fancy appliance. It simply toasts bread, bagels, ect. Its sleek design looks really sharp on any counter. Also love it being a double toaster for my family! Id'd reccomend it for any family with 4+ Toasting Evenness Both bagels, bread, and frozen toaster strudels toast evenly. Although thicker items need longer time to get the middle cooked. Safety Very easy and safe to use. Buttons are easy to read, and I figured out how to work it without looking at the instruction manual. Pretty standard toaster. Ease of Cleaning Like all toasters, its pretty difficult to get compleltely clean. I try to clean as good as possible by using a damp rag to get into the corners for the excess crumbs. Its important to make that the product is unplugged when doing this; although only damp, the wetness can still cause a hazard. I have previously and in the past purchased and used this Cuisinart Metal Classic Four Slice Toaster and found that it really worked good. I love the idea of being able to make four pieces of toast at a time instead of two or make two bagels at a time instead of one. I found that this toaster help make breakfast go a lot faster. The second thing I love about this four slice toaster is the retro look. This toaster truly looks like the toasters we had back in the days and I really like the look. The price of this Cuisinart Metal Classic Four Slice Toaster is a little expensive but it was well worth the price to me. The one thing I do not like about this toaster and any other metal/metalic products is that it was very hard for me to get fingerprints off of it. I found that the outside was hard to clean and it was hard to keep it always shining. Other wise overall I really did love this toaster. I would certainly recommend this Cuisinart Metal Classic Four Slice Toaster to all of my friends and family. My husband and I registered for this toasted for our wedding shower - over six years ago. I can't believe I'm even going to say this, but of ALL the items we registered for, I was MOST excited to receive this toaster! It's amazing. It's sleek and really modern looking, a nice mix of stainless and black that can fit into any kitchen's decor. I LOVE that it has four slice spots - before we only had two. It has a bagel option which is really nice, although I'm not exactly sure what the "bagel" option does differently than the standard setting. The toast/bagel, etc will automatically pop up, or there is a cancel button that you can use to pop it up yourself and check the level of doneness. There are knobs on both side, allowing you to control how dark or light you want your toast. Overall, this is just a great toaster. It's pretty, it's stylish, and it gets the job done. We have had ours for about six and a half years now and it's still going strong. If my toaster died today I would go out and replace it with the exact same one. 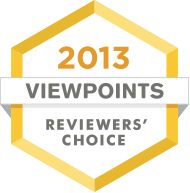 It's great! I really like this toaster. I have a good experience with it. We got this as a wedding gift and have really enjoyed owning it. It looks really nice and fits well in our kitchen. It has four slots so you can cook multiple things at one time. It has multiple cooking times so you can cook things as long or as little as you would like. My food always comes out done to a good temperature. We use it for bread and bagels often. It has held up well for two years for us with no problems at all. I would definitely recommend this product. It is high quality. Toasting Evenness Our food always comes out toasted well. We use it for bagels and bread almost daily. The only reason ours has burnt is because we have set the timer to long. When set to the right time, it works really well. Safety It plugs into the wall. We unplug ours when we are not using it. We have had no problems with safety at all. Ease of Cleaning It is pretty easy to clean. The top gets dirty quickly due to crumbs but it is easy to clean off. Durability We have owned ours for two years and have had no problems with it. Design The design is great. Going from a two slice toaster to a four slice makes any toaster better! But this one has so many other features that make it even better! The slice slots are large enough that you can fit bagels in there and even homemade bread slices. I like that you can life up on the levers to elevate whatever you're toasting so it's easier to take out of the toaster once it pops up. I also like all of the buttons it features. Bagel button, very useful, defrost button helps as well although I don't use this one as much. There's also a reheat button I don't think I've ever used and then the Cancel button which is very helpful so you don't break the levers trying to stop the toasting function in the middle of the toast function. 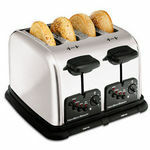 It also has dual dials so that you can toast 2 slices at one temperature and the other 2 slices and a different temperature! It also has two plates that slide out of the bottom of either side so you can remove the crumbs that collect there. With four kids needing something at once, this toaster really comes in handy! Makes getting breakfast ready, a lot faster! Ease of Cleaning Even with the crumb catching plates, there are still crumbs that get stuck in there somewhere and rattle around! Durability With four kids, this thing gets banged around a ton and it's still working! Reliable toaster for the past 5 yrs, toasts unevenly though. We received this toaster as a wedding gift over 5 years ago. We use it everyday. It has held up well and all the buttons, functions, and heating elements still work. It does toast unevenly though, one side of the toast gets a little more crispy and brown than the other side. Also, the bagel button and other functions seem a little unnecessary and don't seem to differ much from the regular toast setting. It is also an attractive appliance. Although the stainless steel finish does attract many finger prints. Toasting Evenness As mentioned in the main description, toast does toast unevenly in this toaster, but its not a big deal. It is a minor flaw in my opinion. Safety Once, a heating element seemed to spark. But I think a crumb attached itself to the heated ribbon. Ease of Cleaning Stainless steel is not easy to clean or keep clean. This is not a fault of the toaster, but just a common problem with stainless steel finishes in general. Durability This toaster is very durable and extremely functional after 5 years. We are happy with it. Design The design is very attractive and 4 slots is a must for a family. Overall I always love using cuisinart products because they're all built to last and last very well until they need to be replaced. Ive also always loved the clean and modern look of the products. 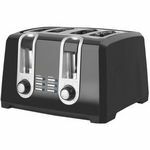 This toaster has a very modern look and its very easy to blend in and match other kitchen accesseries since it has such a basic, yet sleak, silver coating and simple black buttons. 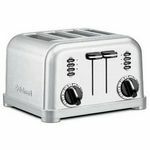 The size is great, it fits 4 piees of toast and 2 bagels in it and all burns/toasts at the same rate and time so there is no piece more brown then the other. Also it has great settings on it much more then the simple time/darkness. It also has a defrost button and a bagel button. I love using these in combination becasue they make a perfect setting when I am dethawing frozen bagels for breakfast. The numerical scale for darkness factor for the toast is spot on as well, you wont lack toasty-ness at a high level or have a burnt crisp at a low level.